"Turn key hotel restaurant bar pool beach"
Hotel for sale in Jaco Beach, Costa Rica.This Hotel is a turn-key business, and is fully operational. Excellent locationi in the center of Jaco Beach, Costa Rica. Just a half block to sandy beach.This popular gorgeous Hotel has 13 spacious room that include cold a/c mini splits, flat screen TV's with cable and WiFi. and large full bathrooms and walk in closets. 11 of the rooms have 2 pair's of queen size beds, and the 2 other rooms have 4 beds to sleep more guest per night. The restaurant is huge and 1 of the longest actual bars in Costa Rica. Ask for measurements. 2 nice pool tables,10 huge flat screens, dart boards, futbol table, owner office, etc. 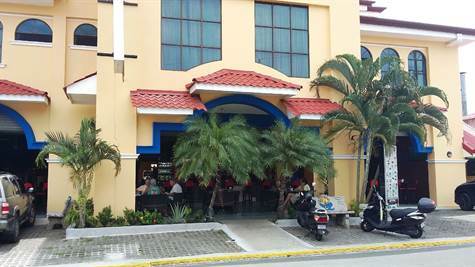 The hotel also has a pool side full bar snack to let customers relax by the pool and get there fresh fruit cocktails and beers with ease. This Hotel is centrality located where guest can see all of Jaco by foot. Nice newly paved street. The pools are very clean and inviting. The seller is always demanding that this Hotel be kept in top shape and you will agree that this beauty is turn-key! Plenty of parking for guest. The Hotel crew are all great girls, very friendly and out going.Well trained with a smile! So much to add that it's better to make an appointment for a showing to really appreciate this beautiful hotel here in Jaco Beach, Costa Rica.